With a population of less than 2,000 people, Morgex is small yet comfortable with excellent infrastructure, bars, and shops. There are several fantastic restaurants that serve hearty traditional dishes, a pizzeria, a tiny bakery selling delicious, freshly-baked bread, pizza slices, and cookies. For special occasions, locals and tourists go to Cafe Quinson, a Michelin-starred restaurant with a warm, Alpine ambiance and outstanding wine cellar. At the lively weekly market, farmers sell fresh seasonal produce, cheeses, and charcuterie. 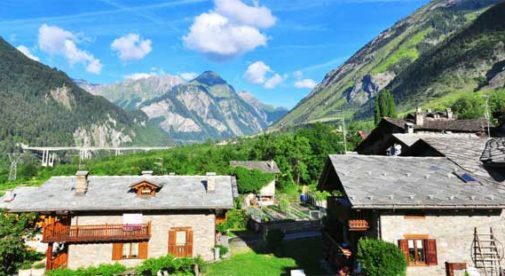 On sunny days, you can sit at an outdoor table in one of the small bars in town, gorge on a rich creamy pastry, sip a coffee…and admire the snow-capped mountain peaks surrounding Morgex. The town is also home to high-altitude vineyards that produce exquisite white wines appreciated by connoisseurs across the world. Although the cost of living in the Italian Alps is higher than in other parts of Italy, Sonya says it is only a quarter of what she used to spend in California. The couple rents a beautiful traditional chalet-style, two-bedroom house with two bathrooms, three balconies, and a small garden for just over $1,000 a month including utilities. Add the groceries and some household items, internet connection, and the total monthly cost for the couple comes to about $2,000. They admit that eating out is not high on their agenda but they do enjoy hearty traditional dishes at a small local restaurant, Da Beppe. A three-course meal with wine never costs more than $25. “Here we spend more time outdoors rather than shopping and eating out,” says Sonya. The couple decided not to buy a car, which saves them the cost of gas and maintenance. The supermarket, bakery, bars, and restaurants are all within a walking distance and going everywhere on foot gives them an excuse to meet the locals and chat. “When we want to go to the nearest city of Aosta, we get a train at the station that is less than five minutes from our house,” says Adam. For a spot of snowboarding or skiing, they hop on a bus to the winter resort of Courmayeur at the foot of the formidable Mont Blanc, only six miles from Morgex. A stress-free, comfortable life in the Italian Alps, what’s not to love about that? Just Where in Italy is Tuscany?